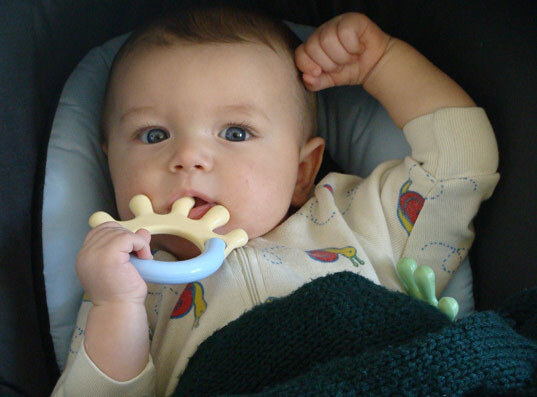 Teething is painful work, and it often causes babies to have very irritable days and long, sleepless nights — both of which affect the entire family. Good thing there’s no shortage of innovative and eco-friendly teethers for little ones to sink their hard working gums into, all of which make it easy to avoid plastic teethers entirely, as they may contain harmful BPA and PVC. Above, Greensprouts cornstarch based hand-teething rattle is toxin free as well as biodegradable and compostable. These delightful crochet teething rings give baby two eco surfaces to chew, soft Oko-tex cotton and hard wood. Pinkhouse Handworks also designs beautifully crocheted teethers that double as entertainment with a soft jingle bell inside. Our top seven picks of green teething toys range from the classic, uber popular Sophie the Giraffe to the lesser known but super convenient Oh Plah! teething bracelet. Babes will have fun clutching and chewing these crafty felted wool teether gnots. This ingenious, handmade teething necklace gives baby something to tug and chew other than your necklace or your hair! Once baby is of appropriate age, whip up a batch of these healthy, vegan teething biscuits and little ones can snack while they soothe their gums. Looking for a gift of sweet relief for a special bambino? Parents and kids alike will be impressed by Little Alouette’s letterpress typography teethers. And don’t miss our 7 natural ways to soothe your teething baby! Good luck growing those pearly whites!